A confortable, contemporarily furnished cottage for max. 6 persons (until June 10th, 2010 – 4 persons!) in a quiet residential area near Pärnu – in Eametsa. The city of Pärnu with her numerous opportunities for freetime activities and a seaside beach is only a short drive away. Wonderfully suited for a family or a small group of people who love peace and quiet. The cottage includes a large, well-maintained lot without fence. Behind the house, about 50 m away, is a river (possibility of swimming, but in the Summer during the dry season the river is shallow). 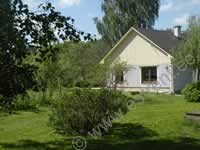 The one-storey cottage consists of a roomy living room, two separate bedrooms, an open kitchen, sauna+shower room, WC. Terrace (access from the living room). Altogether there are 4+2 beds. Possibility of additional beds for small children (2 pcs.). TV. Air conditioning/heating pump, floor heating. Dishwasher. Washing machine. Possibility of barbequing.